On June 29, 2018, the youth writers of OneCity Stories hosted friends, family, and community members to showcase their accomplishments on the final day of the program. One by one, each of the 16 writers from diverse neighborhoods in and around St. Louis, Missouri took to the podium to present multimedia projects they had completed, including poetry, personal essays, podcasts, songs, raps, and short films. The quality and breadth of work that the students shared was impressive, especially considering that the projects were completed in just three short weeks. What was equally obvious was the camaraderie among the young people. From the encouragement as they approached the podium, to the shared jokes and laughter, to the final round of applause for each writer, it was clear that these writers had developed a bond over the weeks of the program. Indeed, even after the celebratory meal of pizza and ice cream had long since concluded, the teens lingered in the outside space, taking photos, exchanging social profile information, and making future plans. As program leaders we also lingered, talking among ourselves about how we might sustain the enthusiasm of this group of students as they headed back to their own neighborhoods where they would attend different high schools in the fall. When we first began envisioning this youth writing program in January of 2016, the St. Louis area was continuing to heal and seek ways to move forward in the aftermath of the death of Michael Brown and the Ferguson protests that followed. Those events and resulting conversations during the summer and fall of 2014 brought racial tensions to a boiling point and shone a light on long-standing racial segregation and discriminatory practices within the St. Louis metropolitan area. As educators, we felt called to both address the problems that divide our community and elevate the voices and stories that weren’t being heard. The concept of connected learning offered us a way to situate our work within multiple layers of connectedness. First, we wanted St. Louis youth to connect with each other through a shared purpose. St. Louis has long established itself as a segmented city of neighborhoods used to define the identity of its residents. 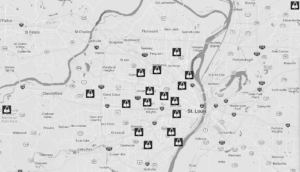 These neighborhoods feed into local school districts, and as a result young people often grow up only really knowing St. Louis within these invisible borders. In designing OneCity Stories, we sought to provide a space for St. Louis youth to connect with one another and a forum to expose all St. Louisans to perspectives that transcend neighborhood boundaries. We also wanted St. Louis youth to connect with their interests in a way that isn’t always possible in school spaces. 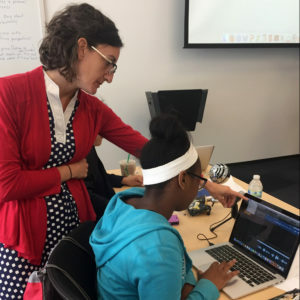 Through partnerships with media organizations, including the St. Louis Post-Dispatch, St. Louis Public Radio, and Cinema St. Louis, high school students from different demographic areas throughout Greater St. Louis were mentored in multimedia production. Using the pen, the microphone, the camera, the stage, and their own inspiration, we invited youth writers to connect with their own futures–and that of the St. Louis community–with their words, images, and actions. The OCS writers come together from all over the metropolitan St. Louis area. 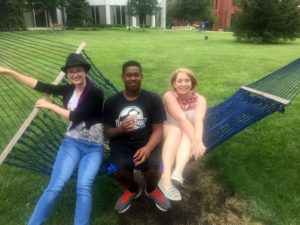 After two summers of facilitating the program, a reality made possible through the generous funding of the 2017 LRNG Innovators Challenge, we have reflected on all we have learned, including our successes and our continuing challenges, and invite you to join us in this work of connecting young people with their interests, each other, and the future through multimedia composition. Community Partners – A significant early challenge was in recruiting media and community partners to work with our student writers. Early in our planning process we identified local media outfits and individual journalists, filmmakers, and career writers who we thought would add expertise and authenticity to our program. We created a shared Google doc where we made notes of our contacts with various organizations and people within those organizations. We started with initial email introductions with our program goals and purposes. If we didn’t get a response, we followed up with a personal phone call when possible. Although we occasionally received an initial “no,” more often we were redirected to a better contact. With patience and persistence, we eventually reached people expressing interest in our program who were willing to come on board. Reporters from the St. Louis Post-Dispatch, a reporter and an editor from St. Louis Public Radio, and a professional with Cinema St. Louis agreed to teach content to our students. 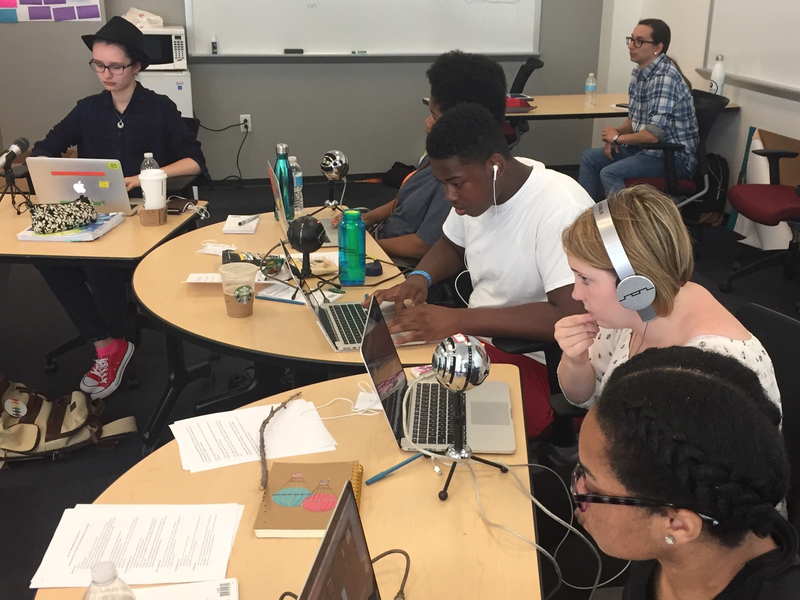 Other St. Louis artists and podcasters provided interviews to our students, and organizations such as the Missouri History Museum, the St. Louis Contemporary Art Museum, St. Louis Public Radio, and Nine Network of Public Media hosted field trips. We also collaborated with the English Department at the University of Missouri-St. Louis, who helped us recruit talented graduate students to serve as artists-in-residence for the program. Prior to the start of the program each summer, we hosted two face-to-face planning sessions with all program leaders and community partners. Collaborating across diverse perspective strengthened our program. In year one, the conversations that emerged helped us find balance between journalistic and creative styles of writing. The year two sessions provided opportunity for us to marry the pedagogical knowledge of our teacher-leadership team with the expertise of our media partners to bring content to students in meaningful and interactive ways. As we move into planning for year three, we are delighted that word has spread. We not only have commitment from our ongoing partners, we have even had others who have heard of our program reach out to us. As we continue to think about these partnerships, we hope to harness the production power of our partners to provide publishing outlets for our students. The big lesson for us, however, is that persistence pays. If you are doing good work with kids, then you will find good people who want to be involved and support you. Erica Hunzinger, an editor with St. Louis Public Radio, assists a writer with her podcast. 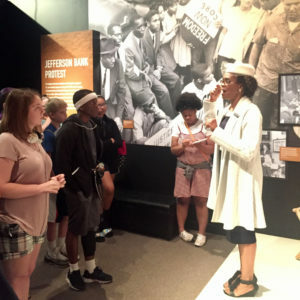 Writers witness a reenactment of the Jefferson Bank Protest at the Missouri History Museum. 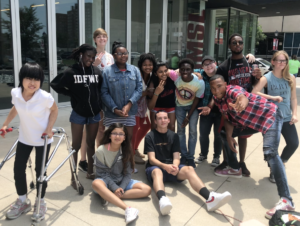 Building Community – We knew that our goal of connecting youth across differences would not be realized unless we found a way for students to immediately start conversing and getting to know each other. Within the first week, we engaged writers in interactive exercises to facilitate conversation and sharing. Because “place” was an important construct for our work, we started with a Metro Mapping activity (Berdan et al., 2006), which asked students to work in groups of 3 – 4 to create a visual representation of the metaphorical stops on the metro line (i.e. events in their lives) that brought them to this destination (i.e. the OneCity Stories program). 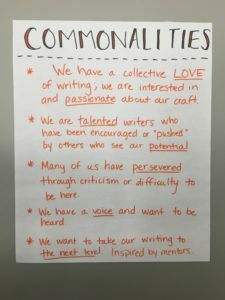 From there we developed commonalities as writers, which provided a springboard into shared norms for our group. We then engaged students in a different mapping activity – social location mapping (Hamilton, 2003) – to help them share different aspects of their identities. We explored narratives about the different neighborhoods of St. Louis and the people who live there in response to viewing the TED talk video of “The Danger of a Single Story” by speaker Chimamanda Ngozi Adichie. Finally, after students learned about interview techniques from our partners at St. Louis Post-Dispatch, they put those skills to work interviewing and writing about each other. At each step of the way, students were writing and talking, which helped break the ice. In addition to these structured activities, informal community building activities also spanned the three-week program. Almost every morning we started our session by inviting students to share “A Rose & A Thorn” from their lives with the group. As they discussed the successes and challenges they were facing, they found additional ways to connect with each other. We also all walked to a local university campus and ate lunch together. This unstructured time allowed them an opportunity to blow off some steam and interact informally. Finally, we encouraged and expected students to share their writing. Although this was not mandatory, we left plenty of wait-time and invited all students by name to share, leaving them less inclined to just stay silent and wait for sharing time to pass. Although some students remained shy in the early days of the program, this consistent routine, along with lots of opportunities for partner sharing and informal discussion throughout the day, eventually created a space where all students shared their writing. Student Choice – The importance of student choice comes as no surprise to anyone who has worked with young people to develop projects of passion; yet, there were some tensions that we had to manage in regard to student choice. First, because we had a goal of engaging students in multimedia production and connecting students with professional media partners, many of whom stemmed from the journalism field, we initially had to decide whether our program would have a solely journalistic focus or whether we would make space for creative writing as well. Next, because we were interested in having students tell their “St. Louis” stories, we debated whether we should have some overarching themes and/or essential questions around which we would ask students to compose. Finally, we also had to consider how we would respond when young people chose to write about or discuss topics and/or use language that would have been considered taboo or inappropriate in many of the settings in which we teach. Ultimately, we decided that the most passionate, authentic writing would come when students had free rein to compose in any medium available using any genre, form, or mixture thereof around any topic about which they desired. We knew that we had to make this program feel unlike a typical classroom space if we were to have students buy in. Yet, we also provided students with inspiration in the form of daily morning writing exercises. For some, these exercises were seeds that grew into larger projects while others used them as simply a way to warm up their voices before continuing an ongoing project or taking off in a new and unrelated direction. In the end, we know that allowing the students the space to be their authentic, uncensored selves made all the difference in the community that was built and the products that were shaped within those three weeks. The 2017 LRNG Innovators Challenge provided the seed funding to get our vision off the ground. As we think about how to sustain our work, we recognize that continued funding is key to our success. If we want to bring together young people from all over the metropolitan area, then we must be able to remove barriers to their participation. This means we have to be able to provide scholarships and transportation for students in need. With our LRNG funding, we were able to provide scholarships to 70% of our participants. As a leadership team, we made internal arrangements to provide transportation to those students who needed it over the last two summers. This is not sustainable in the future as our program grows, yet it is also vital to our program’s goals of bringing kids together. A related challenge is recruiting. The only way we are going to continue to attract a diverse group of students is if they learn about the program. We value the “word-of-mouth” approach that brings some students to our program, but we need to be able to provide other avenues for marketing so that we can reach students from all over the metro area. Although OneCity Stories has a social media presence via Twitter and Instagram, we recognize the need to expand our use of these platforms to bring greater visibility to the program. We also seek new teacher-leaders who will bring fresh perspectives and constructive feedback so that we can continue to strengthen and grow the program. Finally, we hope to be able to sustain the excitement and energy that is generated in the summer program throughout the school year, yet the challenges of doing that grow as the youth return to their own neighborhoods and schools, despite our connectedness via digital platforms. As we move forward we will continue to think about ways to bring more voices to the table, as well as ways to provide authentic reasons for those voices to come together to share themselves and their work with a larger audience. Berdan, K., Boulton, I., Eidman-Aadahl, E., Fleming, J., Gardner, L., Rogers, I., & Solomon, A. (2006). Writing for a change: Boosting literacy and learning through social action. San Francisco, CA: Jossey-Bass. Hamilton, G. (2003). English in the city: Responding to literature in the city. The English Journal, 93(1), 100 – 104.